﻿The Town Cemetery is open to the public year-round during daylight hours. The Town Board makes final decisions concerning the Cemetery based on advice and recommendations on operational and maintenance matters from the Cemetery Committee. The cemetery is also supported by the Friends of Rhinebeck Cemetery, Inc., a not for profit organization working to promote and optimize the history, design and ecology of the cemeteries under the Town of Rhinebeck’s jurisdiction. Conventional and Natural burial plots are available for purchase according to the most current fee schedule. For burial or plot purchase, please contact our Cemetery Caretaker, Garry Slater at (845) 876-3961. Please see below for more information on our Natural Burial Ground, including directions. Here are the Cemetery rules and regulations. Cemetery Caretaker: Garry Slater (845) 876-3961. The Natural Burial Ground at the Town of Rhinebeck Cemetery was opened in 2014 and is only the second municipal natural burial ground in New York State. It is nestled back from historic Mill Road, adjacent to the Grasmere section of the cemetery, and is set in a young hardwood forest on land that once served as pasture to the Grasmere Estate. The Natural Burial Ground is located on Mill Road, ¼ mile from the Route 9 intersection. Turn onto the paved loop road of the Grasmere cemetery. A sign at the rear of the loop road marks the entrance to the Natural Burial Ground. Parking is anywhere along the loop road. No vehicles permitted within the Natural Burial Ground. For plot purchase please contact Caretaker Garry Slater at 876-3961. For a brochure or general questions regarding the natural burial ground you can contact the caretaker, or the cemetery committee chair, Suzanne Kelly, at cemetery@rhinebeckny.gov. Natural, or green, burial is a way of caring for the dead that promotes the natural decomposition of the body with minimal environmental impact. Its ecological aims are to conserve natural resources, reduce carbon emissions, protect worker health and restore and preserve habitat. 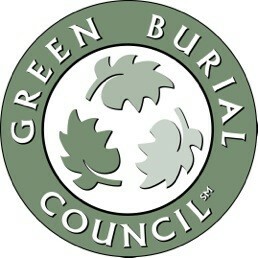 The Natural Burial Ground is certified by the Green Burial Council. Here is more information about green burial standards.